When there is a “food scare”, we usually hear about it as soon as it grabs the media’s attention; the same goes for other defective products. More often than not, however, it takes more than just a small handful of people to be injured, sickened, or killed by a defective product. When was the last time you heard about a recalled product? Were you alerted by the news or a friend? Hopefully, with luck, you were not one of the individuals directly affected by a defective food item or home product. If you share your home with your four legged furry best friend, you have to look out for Fido’s health, not just your own! Dog food recalls, just like other defective product recalls, do not always make headlining news so you need to know where and how to find accurate information to keep your pet safe. Don’t Feed Fido That Food! Animal companions, big or small, are often considered a friend and family member. As a dog owner, you invest a great deal of money in providing the best care you can possibly give your four legged pal, as his love is unconditional and he trusts that you will keep him safe and healthy. So, what happens when your dog gets sick? It could be any myriad of issues which only becomes more frustrating and scary since your dog can’t verbally tell you what’s up. When your dog is acting strange or vomiting or just not “himself”, you are left to play a guessing game and make the vital decision to take him to the vet (where there may be more mysteries to solve). If your dog is affected by defective food, there may be little time to figure out what’s wrong before your dog may become critically ill.
Fido’s Food Makes You Sick? 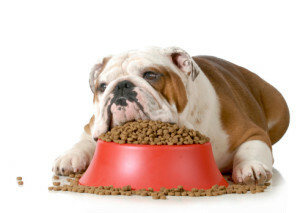 Your dog’s defective food has the potential to make you sick too! While the chances are slim, if you handled contaminated food (such as food with Salmonella) you could become ill. If you notice that your dog’s food has been recalled, toss the rest in the trash even if your dog has not experienced any symptoms. Additionally, it’s always smart to thoroughly wash your hands after handling your pet’s food or treats. As an extra safety precaution, public health officials discourage allowing children under the age of 5 to handle pet food or treats. Your Pet’s Health is Your Responsibility! Remember, your pet cannot communicate how he feeling or why he might be sick. All he knows is how to loyally love you unconditionally. Even if you have purchased a new bag of food and you have found out that it is contaminated, you must make the smart and safe decision to toss it out. You can’t put a price tag on your dog’s well-being, can you? Keep you and your four legged friend safe and healthy!